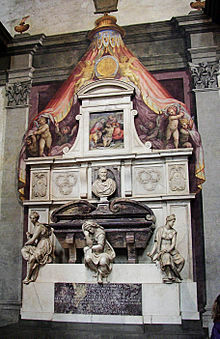 Michelangelo di Lodovico Buonarroti Simoni or more commonly known by his first name Michelangelo (/ˌmaɪkəlˈændʒəloʊ/; Italian: ; 6 March 1475 – 18 February 1564) was an Italian sculptor, painter, architect and poet of the High Renaissance born in the Republic of Florence, who exerted an unparalleled influence on the development of Western art. 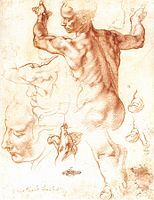 Considered by many the greatest artist of his lifetime, and by some the greatest artist of all time, his artistic versatility was of such a high order that he is often considered a contender for the title of the archetypal Renaissance man, along with his rival, the fellow Florentine and client of the Medici, Leonardo da Vinci. ↑ Smithers, Tamara. 2016. 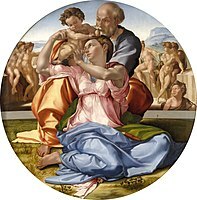 Michelangelo in the New Millennium: Conversations about Artistic Practice, Patronage and Christianity. Boston: Brill. p. vii. ISBN 978-90-04-31362-0. ↑ Emison, Patricia. A (2004). 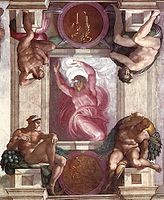 Creating the "Divine Artist": from Dante to Michelangelo. Brill. ISBN 978-90-04-13709-7. 1 2 A. Condivi (ed. Hellmut Wohl), The Life of Michelangelo, p. 103, Phaidon, 1976. 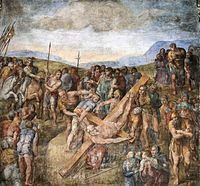 ↑ "Crucifixion by Michelangelo, a drawing in black chalk". The British Museum. Archived from the original on 15 October 2015. Retrieved 24 October 2018. 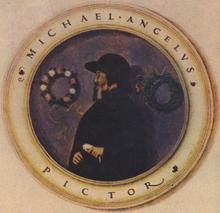 ↑ "Michelangelo, Selected Poems" (PDF). Columbia University. p. 20. Retrieved 24 October 2018. 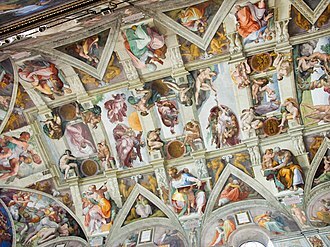 ↑ "Michelangelo's Poetry". 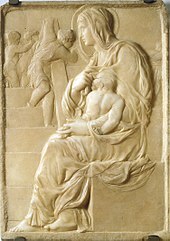 Michelangelo Gallery. Translated by Longfellow, H.W. Studio of the South. Retrieved 24 October 2018. 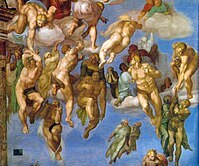 1 2 3 Condivi, The Life of Michelangelo, p. 106. 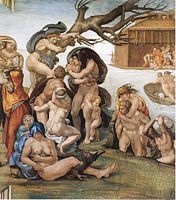 ↑ Hughes, Anthony, "Michelangelo", p. 326. Phaidon, 1997. 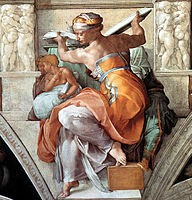 1 2 3 Hughes, Anthony: "Michelangelo", p. 326. Phaidon, 1997. ↑ Rictor Norton, "The Myth of the Modern Homosexual", p. 143. Cassell, 1997. ↑ Vittoria Colonna, Sonnets for Michelangelo. A Bilingual Edition edited and translated by Abigail Brundin, The University of Chicago Press 2005. ISBN 0-226-11392-2, p. 29. ↑ Maiorino, Giancarlo, 1990. 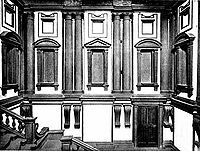 The Cornucopian Mind and the Baroque Unity of the Arts. Penn State Press. p. 28. ISBN 0-271-00679-X. ↑ Di Cagno, Gabriella. 2008. 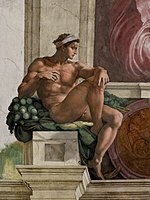 Michelangelo. Oliver Press. p. 58. ISBN 1-934545-01-5. ↑ Tolnay, Charles de. 1960. 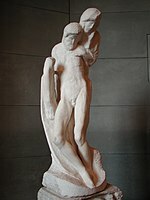 Michelangelo. 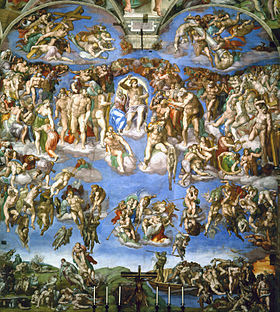 : V, The Final Period: Last Judgment. Frescoes of the Pauline Chapel. Last Pietas Princeton: Princeton Univ. Press. p. 154. OCLC 491820830. ↑ Crispina, Enrica. 2001. 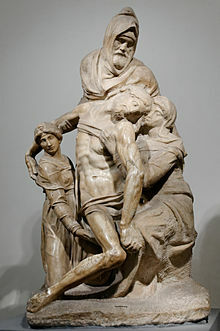 Michelangelo. Firenze: Giunti. p. 117. ISBN 88-09-02274-2. ↑ Ettlinger, Leopold David, and Helen S. Ettlinger. 1987. 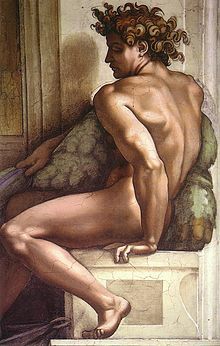 Raphael. Oxford: Phaidon. pp. 91, 102, 122. ISBN 0-7148-2303-1. ↑ Acidini Luchinat, Cristina. 2002. 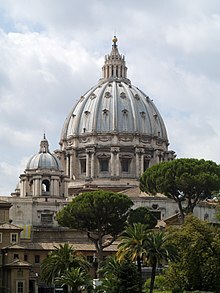 The Medici, Michelangelo, and the Art of Late Renaissance Florence. New Haven: Yale University Press in association with the Detroit Institute of Arts. p. 96. ISBN 0-300-09495-7.